In the autumn of 2016 we quit our jobs and started our very own video game studio. We quickly realized that making games is, in fact, really hard. 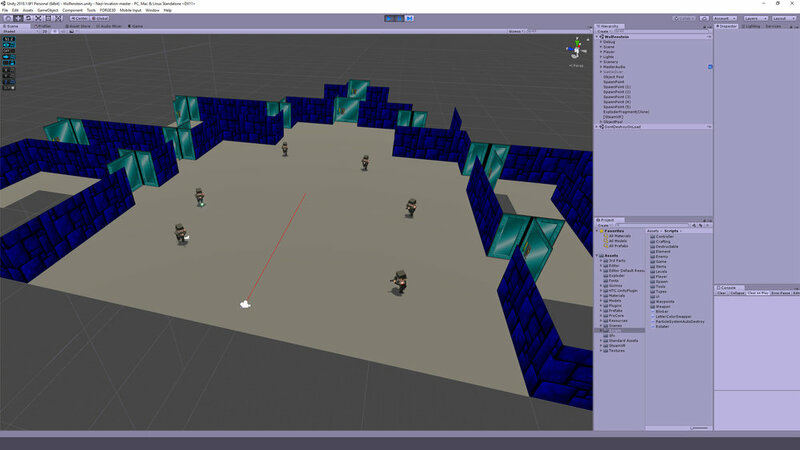 The idea started when we realized that the Unity Asset Store contained all the assets we needed to make a game. We had programmers so that part was easy (we thought) and we had been working with the Unity engine for about 2 years. The parts we were missing (music, sfx, models, etc.) we would purchase from the Asset Store. What kind of games would we make? Well we had been working with VR for the last 2 years and at that time the VR market was expected to grow quite rapidly. So the company would ride the VR hype train and make small and fun VR games. Here then is the story of Panazidox (Paradox + Nazi, get it!?). Built on the fact that people enjoy shooting stuff in VR and everybody hates Nazis. To save the world you must fight this time-traveling Nazi horde. The game was intended to feature several upgradeable weapons, multiple levels and an 80’s action movie vibe. At this point the game had turned into a tower defense of game where you would place heroes (based on 80’s & 90’s action movie heroes) and then possess them. The baddies are still Nazis but now they run through paths in a tower defense style. At this point the game had again changed direction. Now each level is inspired by other video games. The first one was supposed to feature Wolfenstein and Doom. The assets are of course placeholders, (we had no intention of stealing art from Wolf3D for the final product). Here the player could block using a shield, switch between several weapons, use a tractor beam to collect energy orbs to travel to new levels and we even had a crafting system that would allow players to create new maps by combining different maps. Get honest feedback from different people early on, nobody is going to steal your idea. By the end we had created a mess of a game that was way too complicated. Opening these projects in Unity now I realize that the first iteration was by far the best one.